The Governors Awards, presented in November by the Academy of Motion Picture Arts and Sciences, has for the past nine years served as an elegant appetizer to the frenzied smorgasbord of Awards Season. And given that the Academy Awards is the de facto coup de grace of this months-long feast of accolades and jostling for a place at the table du jour, the Governors Awards doubles down as a formal-wear—albeit untelevised—must-stop for the front-runners. But the essence and bona fide classiness of the Governors Awards is defined by the evening itself, set aside and magnified for a group of distinguished and impactful legends—who have, for whatever reason, been overlooked by the Academy voters despite their undeniably influential body of work. This year's slate of honorees included cinematographer Owen Roizman and actor Donald Sutherland, as well as a special award to Alejandro G. Inarritu and Emmanuel Lubezki for their remarkable VR project, Carne y Arena, which addresses the harsh complexities of cross-border immigration. Those dignitaries aside, I was there for the other two honorees, Agnès Varda and Charles Burnett, both of whom have demonstrated a deep cinematic empathy as a well as a facility in crossover from fiction to nonfiction. As the de facto "Grandmother of the French New Wave," Varda embodies a rich cinematic history, while carving out her own niche as an indelibly wise and curious observer and documenter of life. The Gleaners and I, The Beaches of Agnès, Ulysses, Mur Murs and the elegiac Faces Places: these are some of the works that celebrate places and the people who enrich them. Burnett, while best known for such fiction gems Killer of Sheep, The Glass Shield and To Sleep with Anger, has made a smattering of documentaries throughout his career, about such iconic figures as Nat Turner and Dr. Endesha Ida Mae Holland, and such themes as immigration and diversity (America Becoming). He is currently working on a documentary about hospitals and health care during the civil rights movement. Among the many presenters vouching for Varda, Documentary Branch Governor Kate Amend recalled working on a tribute reel when Varda was honored by the IDA in 2002 with a Pioneer Award. "Editing that reel was a wonderful crash course in magical filmmaking," Amend said. "It was so powerful—the poignancy, the joy and the love. Every frame was a work of art." She cited a quote from Varda herself about The Gleaners and I: "Filming, especially a documentary, is gleaning, rummaging, scavenging…things without owners, clocks without hands. Myself, I am just as much a gleaner." Also testifying for Varda, Angelina Jolie said, "Throughout her career she has held up to the viewer the beauty and nobility of everyday life…and the dignity and heroism of the person next to us—their struggles , their memories and their value…She is, first and foremost, an artist, a creative force, a brilliant mind, an inquiring spirit, a communicator. That woman artists still have to fight to be free to pursue their craft on an equal footing today is something I imagine she never expected. So we need to draw strength from artists like Agnès. To be around Agnès is to feel more oxygen come into the room, to feel that sparkle, that sense that anything is possible." 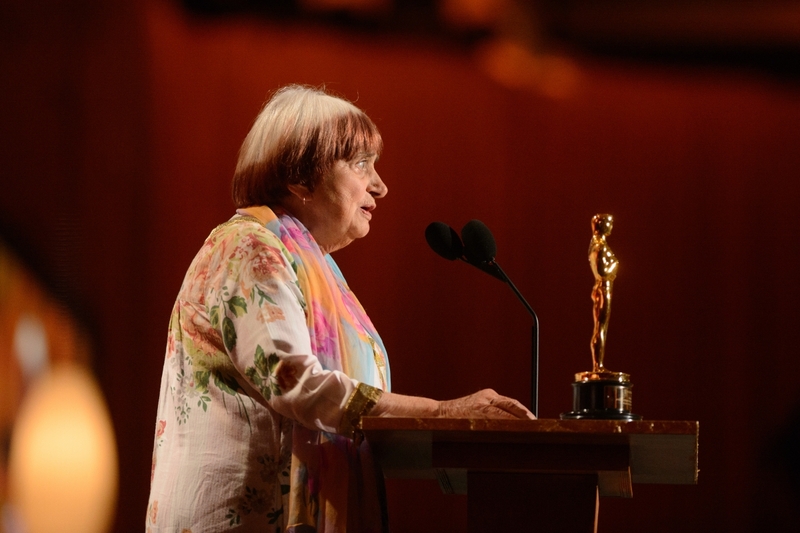 Varda took the podium, a little nonplussed from all that praise. "I tried to get to the essence of cinema, finding different structures for each film," she explained about her fiction work. "And then I went back to the school of modesty, which is documentaries…The other day I woke up in the middle of the night thinking about my speech; I got nervous. But after a while, for some reason, I started to forget about feeling the weight of my body; I felt like dancing. Tonight is a big event, very serious, full of meaning and weight. But I feel that, between weight and lightness. I choose lightness, and I feel like I'm dancing the dance of cinema." And with that, she and Angelina Jolie joined hands for a spirited pas de deux around the podium. Following a tribute reel about Charles Burnett by Shola Lynch (Free Angela and All Political Prisoners) and encomia from Reginald Hudlin and Sean Baker, Ava DuVernay addressed the crowd. She recalled how she showed Burnett a cut of her first documentary: "I wrote in my journal, 'He was gentle and generous and full of grace; I met a giant today.' For the first time a major artist said to me, 'You have something to say, something valuable to put out in the world.' And in that moment, he made me visible to myself. In a world of visual culture, visibility remains highly political and a much-contested concept that touches upon issues of identity and representation, ethics and responsibility, recognition and justice. Charles Burnett has made the Black community visible, and he's been visible to the Black community." Turning to Burnett, DuVernay asserted, "You've been a giant to us, a legend to us, an icon to us, long before tonight. To work, to create, to craft your films with no promise of industry consideration, support or recognition for decades upon decades is the mark of a true artist. Your masterful attention to style, your use of folkloric traditions, and your engagement with the social and political world around us has centered Blackness and has rendered us visible, valuable and victorious." Burnett talked about his years as a student at UCLA: "They gave you a camera and said, 'Go out and make a film, and don't come back with something we've already seen.'" He cited one of teachers, documentarian Basil Wright, as an influence. "I remember having difficulty when I first went to UCLA. At the end-of-the-quarter screenings of the best of the student films, they were all about flower children, people who made films in Topanga Canyon. Where I came from, it was about getting a job and keeping a job. Those were the kind of films I wanted to do, and it was Basil Wright who pointed me in that direction." Burnett's classmates at UCLA included Julie Dash, Billy Woodberry, Halle Gerima and Ben Caldwell, who constituted the core of the "LA Rebellion" movement of Black filmmakers in the 1960s and '70s. "We had meetings every night, talked about what is a Black film, what is our responsibility, what do we have to do," Burnett recalled. "We were also part of the civil rights movement and we had an obligation to tell our stories because Hollywood had been distorting our story since Birth of a Nation. It was incumbent upon us to tell our narrative in our own way. My ideas came from that period; we were interested in making a difference and using films as a means for social change." Burnett concluded by recalling the effect of a particularly discouraging teacher from middle school on the early phase of his filmmaking career. "I never really felt secure in what I was doing. I had this feeling that I what I did wouldn't have meaning, that I didn't have what it took to make things work.…But getting awards like this make those unkind words insignificant. It means that I'm getting further and further away from this stigma." Tom White is editor of Documentary.